The Nerf Elite Series is meant for The Nerf Elite to move in, execute a mission and move out. The better your skills, the faster the mission can be complete. 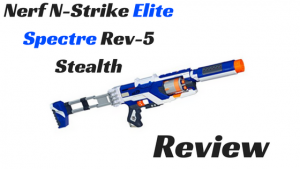 Make sure to get your friends and yourself ready by reading all The Elite Series Nerf Gun Reviews and getting the mission down perfectly before executing! 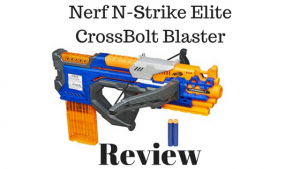 With The Nerf N-Strike Elite CrossBolt Blaster, you load the 12 Nerf Dart Magazine and fire one Nerf Dart with the draw back of the top action that also pulls back the draw string that gives your real Crossbow Firing Nerf Action! 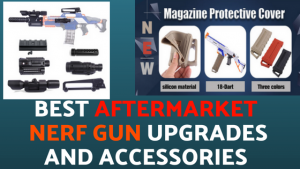 When you want a Nerf Gun that is stable as a Nerf Rifle with the Stock that folds down when you don’t want to use it and back out when you need to focus a shot. Only 5 Nerf Darts is a bit low on Ammo Capacity, but The Spectre still gets the job done! 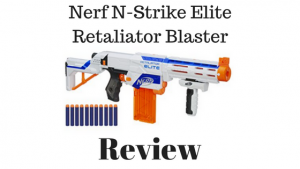 The Nerf N-Strike Retaliator Blaster is very useful in many situations, really any situation. From on the run firing to hunkering down behind something for cover, you can get a lot done if you know what you are doing! Practice makes perfect, practice a plan, execute a plan! 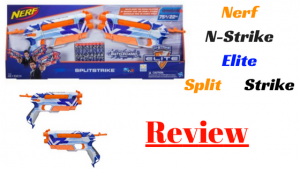 Not only do you get 1 Nerf Gun, But With The Nerf N-Strike Elite Split Strike you get 2 Nerf Guns in one! When you want to take out targets that are in different locations at the same time, Split your Split Strike and take out both targets at once and look like a BadA** doing it! 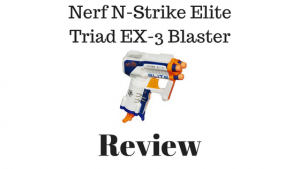 Small but mighty, The Nerf N-Strike Elite Triad EX-3 Blaster is small and compact but still allows you to load 3 Nerf Darts in and fire one at a time with the pull down of the bottom lever and pull of the trigger! 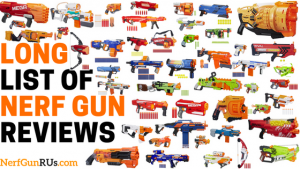 A great secondary Nerf Gun to take with you, really anywhere you don’t want to find yourself Nerf Gun Defenseless! 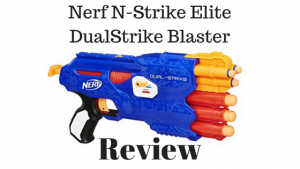 When you want a Nerf Gun that is not only easy to use, but also fires 3 Nerf Darts and 3 Nerf Mega Darts, you will be ready for any situation with The Nerf N-Strike Elite DualStrike Blaster. The side switch makes it easy to chose your Nerf Dart Type, and the smart air technology makes sure all your shots count! 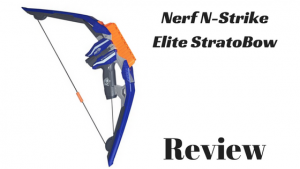 The Nerf N-Strike Elite StratoBow is perfect for anyone looking to harness the power of the Nerf Archer! If you are someone who has a certain calling to a bow, you need to use your skills to become the most feared Bow Master In All The Lands! 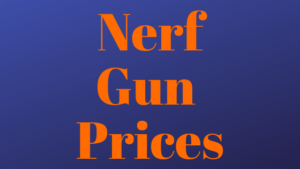 If you are looking for a Nerf Gun with easy maneuverability, fully automatic, and a good ammo capacity. 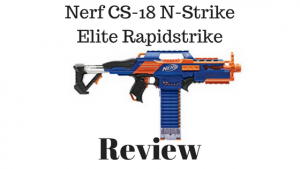 The Nerf N-Strike Elite Rapidstrike CS-18 would be a good option for you to do some more research on! Eliminate anything you want, with a few shots, or even the whole magazine! 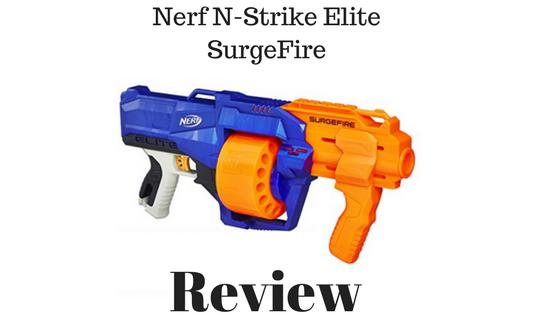 When you want to unleash 15 Nerf Darts in the matter of seconds with full SlamFire Action, that is exactly what The Nerf N-Strike Elite SurgeFire is meant for. With a 15 Nerf Dart drum designed to spin for quick SlamFire shooting, all you have to do is hold down the trigger and pump at will! 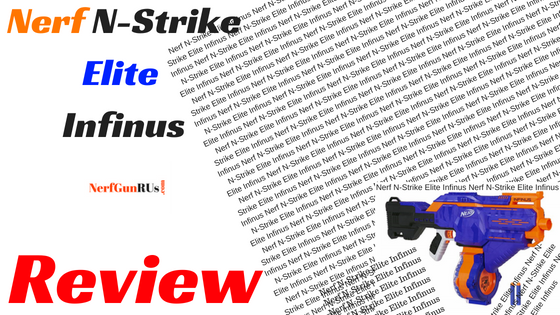 The Nerf N-Strike Elite Stryfe Blaster is a motorized Nerf Gun that has the capability to have a stock attachment, barrel attachments, and top and bottom tactical rail attachments. You get a 6 Nerf Dart Magazine, hold down the motor trigger, then fire at will! 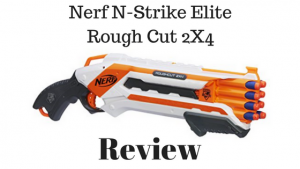 The Nerf N-Strike Elite Rough Cut 2×4 is a shotgun styled Nerf Gun that is meant to get in and get out. 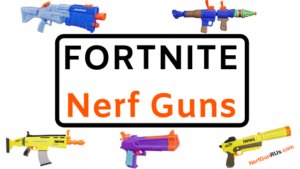 You use the pump action then pull the trigger to fire 2 Nerf Darts at a time, or you can hold down the trigger and use Slam Fire to fire 2 Nerf Darts with every slam of the pump! 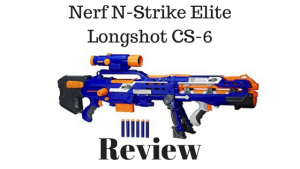 When it comes to long range firing, you want to check out The Nerf N-Strike Elite Longshot CS-6. You get 6 Nerf Elite Darts to fire at anything you want, from any distance you want. Pull the side lever to load, aim down the scope and pull the trigger to fire one Nerf Dart as far you can! 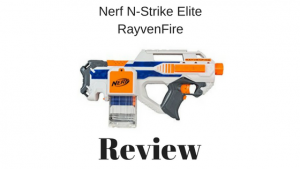 The Nerf N-Strike Elite RayvenFire has been revived from the Nerf discontinued graveyard, only this time The RayvenFire comes with a 10 Nerf Dart magazine instead of an 18 Nerf Dart magazine, but that is nothing to worry about, upgrade your magazine and you still have the same awesome Nerf Elite RayvenFire only with a new paint job! An Amazon Best Seller for a reason. 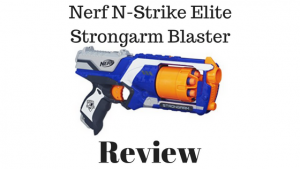 The Nerf N-Strike Elite Strongarm Blaster has the original Nerf Gun design that has been around for a while, for one simple reason. 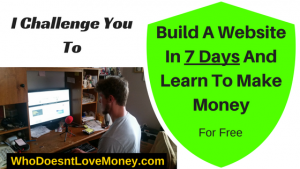 This design works and keeps working! Rotating 6 Nerf Dart holding barrel that fires with the pull of the top pump and pull of the trigger! 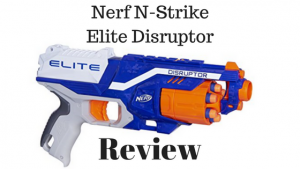 The Nerf N-Strike Elite Disruptor is the newer “upgraded” Strongarm, the only difference is instead of flipping the rotating barrel to the side and reloading, you just load your Nerf Darts into the front. Much easier to load on the run or stop and reload very quickly! 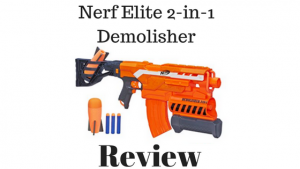 If just shooting Nerf Darts at your target isn’t enough for you, then you will want to check out The Nerf Elite 2 in 1 Demolisher! 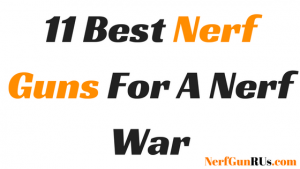 Not only do you get 10 Nerf Darts that you warm up the motor and fire with the simple pull of the trigger, but you also get to fire 2 Nerf Missiles, one at a time, out of the front Nerf Missile Launcher! 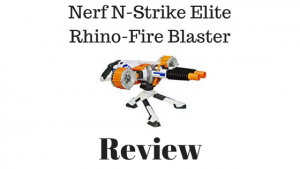 If are someone who wants to get to higher ground and wipe out everything that you can see from up there, then The Nerf N-Strike Elite Rhino-Fire Blaster is a good option for that. A turret styled Nerf Gun that holds a total of 50 Nerf Darts allows you to take out anything that comes into view! 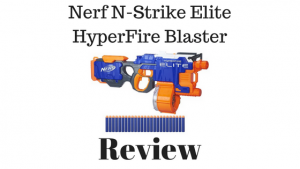 The Nerf N-Strike Elite HyperFire Blaster is the fastest firing fully automatic Nerf Gun you can get! With a 25 Nerf Dart drum, you warm up the motor and fire away! Let everyone know you mean business by wiping out everything in sight by unloading your whole drum in just seconds! 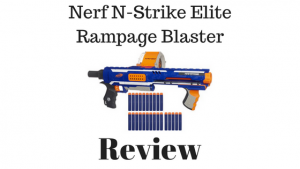 With The Nerf N-Strike Elite Rampage Blaster, you have the option to go on a SlamFire rampage by holding down the trigger and slamming the pump action, pumping and firing one Nerf Dart at a time or using a combo of the two options, you have 25 Nerf Darts in your drum, use them how you wish! If you need to fire fast, you have the option, but if you want to conserve, you have that option as well! Never worry about running out of ammo and having to take the time to pull out your magazine to load it by hand. With The Nerf N-Strike Elite Infinus, scavenge Nerf Darts off the ground and shove them in the auto loader that loads your magazine with speed and the best part of not having to remove the magazine or clip. The Whole Point Of The Nerf Elite Series, The Largest Series, Is To Get In And Get Out, With Your Whole Team Still In Tact! 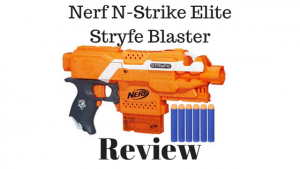 Whether you take The Nerf Elite Stryfe, or The Nerf Elite Rampage, you will get The Job Done Right! Just make sure you practice the mission first! Never want to be caught off guard! 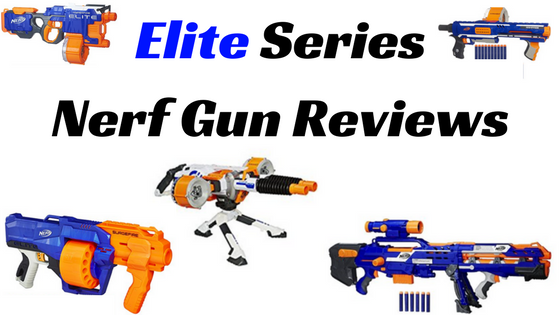 Elite Nerf Guns Are Meant For The… Elite!